Update Nov 30: see Richard Brooks in the Guardian. "The world's second-largest beer company, SABMiller, is avoiding millions of pounds of tax in India and the African countries where it makes and sells beer by routing profits through a web of tax-haven subsidiaries, according to a report published by ActionAid today." ActionAid estimates it may have reduced its African corporation tax bill by as much as a fifth last year, depriving poorer countries of up to £20m (US$31m) in tax. "Marta Luttgrodt sells beer from her small stall in the shadow of Accra Brewery, SABMiller's Ghanaian subsidiary in the capital city. . . . Luttgrodt sells beer from the factory for 90p a bottle and manages to make £220 profit a month. She pays fixed fees of £11 per month to the Accra authorities and a further £9 per quarter to the Ghana Revenue Authority." And compare that to the income tax that the income taxes paid in Ghana: zero. "I don't believe it," she said when told this. "We small businesses are suffering from the authorities – if we don't pay, they come back with a padlock." An SAB spokesman said there were sound commercial reasons for structuring its business through tax havens, adding that "we dispute that we have avoided paying any tax." Once you read the detail of ActionAid's report, it becomes clear that the spokesman's last sentence comes from the Philip Green school of tax avoidance. It all depends on what you mean by the word "avoid." ActionAid's report, drawing on the expertise of top UK tax expert Richard Brooks, shows SABMiller's tax avoidance games in forensic detail. Tax avoidance, of course, is not illegal. But it is wrong. 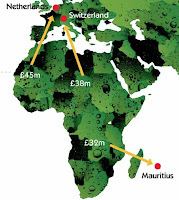 Swiss sidestep: SABMiller’s African and Indian subsidiaries pay ‘management service fees’ to sister companies in European tax havens, mostly Switzerland, where effective tax rates are much lower. The head of the Ghana Revenue Authority told ActionAid that “management fees is an area that we know is being used widely [to avoid tax] . . . it’s difficult to verify the reasonableness of the management fee”. Mauritius manoeuvre: A Mauritius subsidiary sees its trading profits taxed at 3% compared to 25% on its trading partner in Ghana. Thin capitalisation: another transfer pricing scheme, where the African subsidiary borrows from the Mauritius subsidary, deducting its interest payments from the final tax bill, while the Mauritius subsidiary's lending profits (derived from those same interest payments) are taxed minimally. "SABMiller isn’t a lone bad apple. Its tax avoidance practices are far from unusual, conforming to the model followed by multinational companies the world over." Indeed. This is a scourge that is going on all over the world as corporations, in a quest to maximise profits for shareholders (usually wealthy ones) at the expense of the wider societies in which they are embedded, seek to free-ride on the services paid for by others: the education, infrastructure, rule of law and many other things that enable them to make their profits. South Africa's former Finance Minister Trevor Manuel called it "a serious cancer eating into the fiscal base of many countries." "We follow all transfer pricing regulations within the countries in which we operate and the principles of the OECD guidelines." "Tax authorities in developing countries are fighting hard to stop tax dodging but the reality is they are locked in a David and Goliath-style battle with multinational companies. International standards governing the taxation of big business are stacked against them." They are indeed - and read more about it on our transfer pricing page. "SABMiller said its companies "pay a significant level of tax", adding that in the year ended 31 March 2010, the group reported $2.93bn (£1.88bn) in pre-tax profit . "During the same period our total tax contribution remitted to governments – including corporate tax, excise tax, VAT and employee taxes – was just under $7bn, seven times that paid to shareholders," the company said. "This amount is split between developed countries (23%) and developing countries (77%)." This looks impressive, but it needs serious unpacking. This appears to be from a concept apparently designed by PriceWaterhouseCoopers called the "total tax contribution" whereby a firm rakes in every single tax it can conceivably claim to be associated with its business, and claims it for itself. So it will claim, for example, Value Added Tax paid on its businesses, and employee taxes. But of course much of the VAT is paid by consumers, not by PWC. Similarly, the employee taxes are paid by the employees. They are not taxes borne by the company. It is a very clever idea, and we will be seeing a lot more of this Total Tax Contribution, now that people are beginning to wake up to the issue of tax avoidance. "PwC is trying to get corporations to pretend their tax bills are bigger than they really are, by counting not just their actual taxes, but also taxes they don't pay, such as those paid by their customers, workers, suppliers, and so forth." "This is bilge -- to put it nicely." (Murphy has more to say on the Total Tax Contribution framework here, here and here. This is one of the problems with tax, more generally. International tax is so complicated that when investigators publish excellent research on corporate tax avoidance schemes, it is relatively easy (as with the recent Vodafone story) for corporations and their supporters to publish their own re-interpretation of the same information, sowing confusion in the public mind. While it always makes sense to look at the other side of any argument, we should remember that corporations have an awful lot of leeway in presenting the facts in ways that present themselves in the best possible light. ActionAid has done some excellent and important work here. If you want to act, click here. Well I beg to offer a comment. There seems to be an error in your interpretation of employer taxes. In calculating employee costs for say person A. The company budgets e.g 2000. The tax paid as a result of this income is part of the employers cost although it is paid in the name of the employee. Meaning if the employer does not pay, there is no taxes at all. SAB Miller's shareholders should be advised of what is happening in Ecuador. They company officials here hired a "lawyer" who wasn't a lawyer, and paid hin over $600,000 usd , to help solve a case involving ex employees. The "lawyer's brother just happened to be the trail judge who was presiding over this case. Low and behold, SAB Miller won the case. As it turns out, the "lawyer" never held a diploma to practice law, the brother has been thrown off the judicial council in Ecuador and is being investigated for receiving bribes. This is illegal and the the Justice Department in the USA should also investigate this company's activities.